If we were in a normal news cycle, we’d be hearing nothing but Roy Moore until the election next month. But we’re not, and several things have turned in Moore’s favor this week. He also made an extremely smart political move that the pundits will hate and Alabamians will hear him out on. The first good news for Moore this week was Trump finally talking about the race. It was a long time coming, and many were understandably upset that he had been silent on the race for the past few weeks. Mr. Trump also said he was “very happy” that women in the United States are now coming forward with accusations of sexual misconduct against lawmakers and media figures, many of them Democrats. It’s not exactly a ringing endorsement, but with how factional and divided Republicans are on Moore, Trump’s support actually goes a long way. 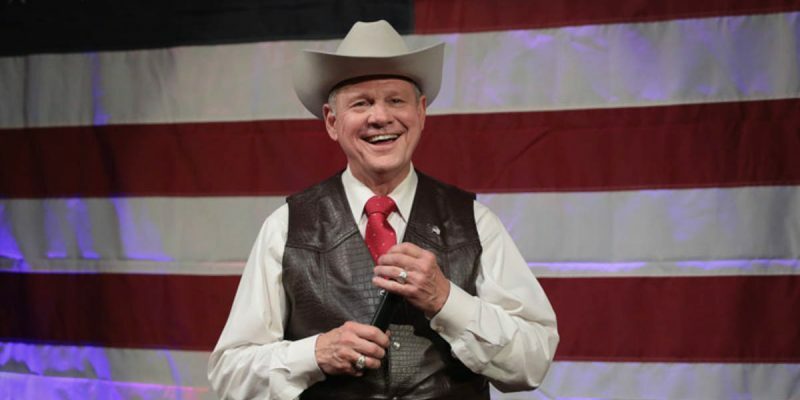 There has been talk from Mitch McConnell and other GOPers about a possible write-in campaign to put someone besides Moore in office, but Trump’s support for Moore makes it highly unlikely that will now happen. Even before all these allegations came out, Trump’s support for Moore has been tenuous at best; let’s not forget his initial pick was Luther Strange in the primary. So this is going to go a long way in comforting Alabama Trump supporters that Moore is the right guy for the job. Of course, the Democrats also blessed Moore this week with their own sexual indiscretions. Al Franken and John Conyers, both beloved on the left, are on the ropes with the way they’ve treated women on the years, and unlike Moore’s case there’s actual evidence for both. The Democrats are putting out their own fires right now, so there is less time for them to focus on the Moore campaign. Not to mention that trying to bring down makes them look pretty hypocritical. The left has been walking around with puffed out chests since the Moore scandal began, but we’re just beginning to peak into the skeletons in their closets. And then there’s the gift that keeps on giving, Moore’s opponent Doug Jones. Whatever your opinion on Moore is, I’m pretty sure every conservative can agree that Jones going anywhere near the U.S. Senate would be nothing short of an unmitigated disaster. As Trump pointed out, Jones is just a terrible, terrible candidate. This is a guy who seems out of line with almost every value that Alabamians hold, and he doesn’t even seem to like the state that much. But far and away, his biggest sin is his stance on abortion. Alabama is a state where 58 percent of the population believe that abortion should be outright banned, so you would think Moore would at least try to cater to those deeply embedded values. In late September, Jones made the bewildering statement that he wouldn’t oppose abortion 20 weeks into a pregnancy. “So you wouldn’t be in favor of legislation that said, ban abortion after 20 weeks or something like that?” Todd asked. “I’m not in favor of anything that is going to infringe on a woman’s right and her freedom to choose. That’s just the position that I’ve had for many years. It’s a position I continue to have,” Jones said. “That’s where I become a right to lifer,” he added. This week, Moore and his supporters are capitalizing on this awful position. The Courageous Conservatives Pac released a solid ad that hones in on Jones’ pro-abortion stances, as well as being anti-Confederate monuments and pro-transgender bathrooms. In truly Trumpian fashion, Moore tweeted out #AbortionJones with a link to Jones’ initial statement, which got a boatload of favorable feedback. This is where Moore really needs to dig in. Even if the allegations of Moore were presumed to be true, a guy who is head over heels in love with abortion is a lot more egregious to many Alabama voters than a guy who has allegations of sexual assault from a newspaper that they hate. Especially if the abortion-supporter is a Democrat. The latest poll shows Moore with a two-point lead. If he keeps this up and pending any unexpected information surfacing, the tides may be changing for Moore’s campaign. My guess is that lead will get a little bigger in the next poll.